Structure refers to the ways in which soil particles are arranged or grouped spatially. The groupings may occur at any size level on a continuum from either extreme of what are nonstructural states: single grained (such as loose sand grains) or massive aggregates of aggregates (large, irregular solid). An additional aspect of aggregates, their stabilization once they are formed, is significant for soil ecology. Stabilization is the result of various binding agents. Plant and microbial polysaccharides and gums serve as binding agents (Harris et al, 1964; Cheshire, 1979; Cheshire et al, 1984). A variety of other organic compounds act as binding agents (Cheshire, 1979), and some biological agents such as roots and fungal hyphae (Tisdall and Oades, 1979, 1982; Tisdall, 1991) play a similar role. The implications of soil structure refer not only to the particles but also extend to the pore spaces within the structure, as noted earlier. Indeed, it is the nature of the porosity that exists in a well-structured soil that leads to the most viable communities within it. This in turn has strong implications for ecosystem management, particularly for agroe-cosystems (Elliott and Coleman, 1988). There is a very active area of research in soil ecology related to dynamics of micro- and macroaggre-gates, in relationship to drying-wetting cycles and tillage management. Denef et al. (2001) measured marked differences in aggregate formation and breakdown as a function of amount of bacterial and fungal activity in soils with 13C-labeled crop residues. They traced differences in fine intra-aggregate Particulate Organic Matter (POM) to variations in wetting and drying regimes versus those soils not experiencing such environmental fluctuations. We discuss the aggregate formation process further in Chapter 3 on microbes and their effects on ecosystems. May occur in any part of profile. At times inherited from the soil material. Both usually subsoil manifestations. Common in soils of arid and semiarid regions. Common in heavy subsoils, particularly those of humid regions. Characteristic of the furrow slice. Subject to wide and rapid changes. FIGURE 1.8. 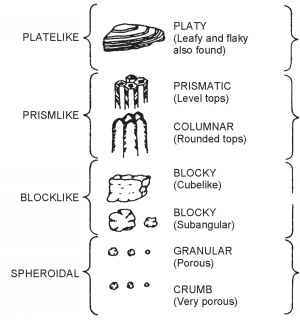 Various structural types found in mineral soils. Their location in the profile is suggested. In arable topsoils, a stable granular structure is prized (from Brady, 1974). ture, moisture, and chemical and biological conditions at various levels in the soil profile. Another concept is helpful in soil structure: the pedon. This is an area, from 1 to 10 square meters, under which a soil may be fully characterized. Later in the book, we will consider the arrangement of soil units in a landscape, and in an entire region. Next, we will examine some of the causes for the formation, or genesis, of soil structure. Input of organic matter to soil is one of the major agents of soil structure. The organic matter comes from both living and dead sources (roots, leaves, microbes, and fauna). 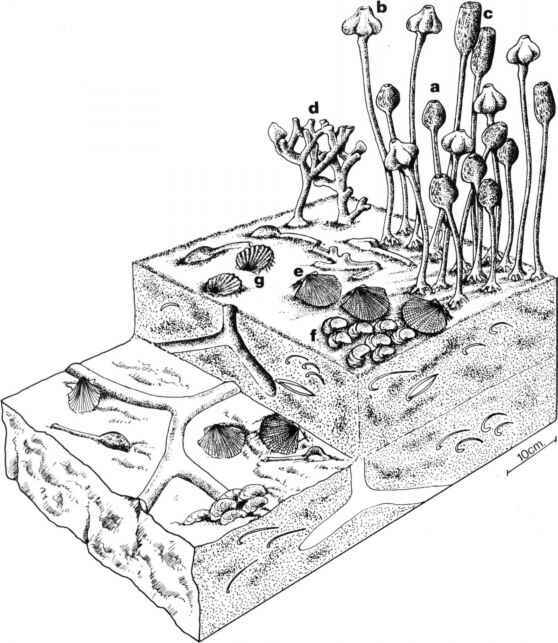 Various physical processes, such as deformation and compression by roots and soil fauna, and freezing-thawing or wetting-drying, also have significant influences on soil structure. It is generally recognized that plant roots and humus (resistant organic breakdown products) play a major role in the formation of aggregates (Elliott and Coleman, 1988; Paul and Clark, 1996). However, bacteria and fungi and their metabolic products play an equally prominent role in promoting granulation (Griffiths, 1965; Cheshire, 1979; Foster, 1985). We will explore organic matter dynamics in the sections on soil biology. The interaction of organic matter and mineral components of soils has a profound influence on cation-adsorption capabilities. The interchange of cations in solution with cations on these surface-active materials is an important phenomenon for soil fertility. The capacity of soils to adsorb ions (the cation-exchange capacity) is due to the sum of exchange sites on both organic matter and minerals. However, in most soils, organic matter has the higher exchange capacity (number of exchange sites). For a more extensive account, see Paul and Clark (1996). There is a hierarchical nature to the ways in which soil structure is achieved, and it reflects the biological interactions within the soil matrix (Elliott and Coleman, 1988; Six et al., 2002). Several Australian researchers (Tisdall and Oades, 1982, 1984; Waters and Oades, 1991) have noted how the processes of structuring soils extend over many orders of magnitude, from the level of the individual clay platelet to the ped in a given soil. For most of the biologically significant interactions, one can consider changes across a range of at least six orders of magnitude from <0.01 ^m to <1 cm (Tisdall and Oades, 1982) (Fig. 1.9). Not all soils are aggregated by biological agents; for heavily weathered Oxisols with kaolinite-oxide clays, there seems to be no hierarchy of organization below 20 Mm, because only physicochemical forces predominate there (Oades and Waters, 1991). Studies in our Horseshoe Bend agroe-cosystem project at the University of Georgia have uncovered significant differences between tillage regimes (conventional, moldboard plowing versus no-tillage, direct drilling of the seeds into the soil). The aggregates in the 53-106 Mm and 106-250 Mm categories are most affected by fungal growth and proliferation, reflecting physical binding and the increased amounts of acid-hydrolysable carbohydrates, which are more prevalent in the no-tillage treatments as compared with the bacteria-dominated conventional tillage systems (Beare et al., 1994a, 1994b, 1997).